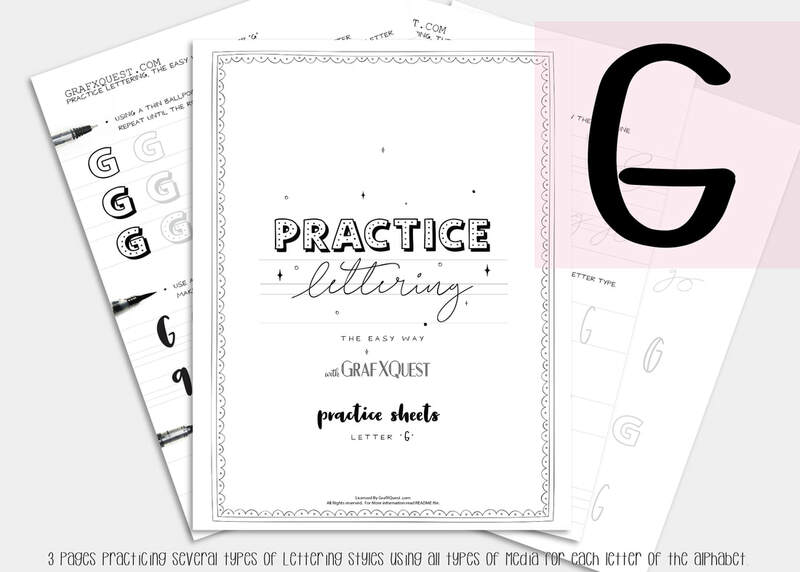 Several posts ago we started you out with some practice sheets so you can start getting the feel of playing with lettering. You will also be able to print those sheets out as many times as you like to have extra space to practice the above lesson. You can get them here: Practice Sheets. You can also see the previous posts you missed starting with the Letter A here : Lesson A Get the print outs here: Letter A Printouts , Letter B Printouts , Letter C , letter D, letter E and letter F Printouts! Want to share these with someone else? We ask that you do not share our files, instead share our link above to this post. Thanks. Be sure to read the first post for letter A as it will have some important hints to help you along with the rest of these lessons. Lets Move on to to the letter F.
Following the instructions laid out in our last posts on the letters A, B, C, D, E and F be sure to print out your letter G files to follow along. The Letter G Lesson will be available free until March 26th 2019, at which point it will then become a $1 to help support the site. Hurry get it now. All lessons in this blog are for letter formation and tips for learning Hand lettering and may apply indirectly towards the kit you are working on. However these lessons should assist in most if not all cases in developing your lettering skills with these lessons. We will assume you now have read the posts on the letters A,B,C,D, E and F plus have printed out your G files and practice sheets, and are ready to work! Let me first start by saying, that by no means should you rush out to buy these supplies. You can always use what you have on hand. But it's always good to be exposed to different methods. We’ve all seen beautiful lettering with extra crisp hairlines and whimsical twirls. In this case it is helpful to have tools that can make this easier. For dramatic lettering, the brush pen tip should be soft and elastic so that you get more stroke variation. Pigmentation is also another consideration. We will look at both today. I do recommend using a dark black ink to convey your message boldly. 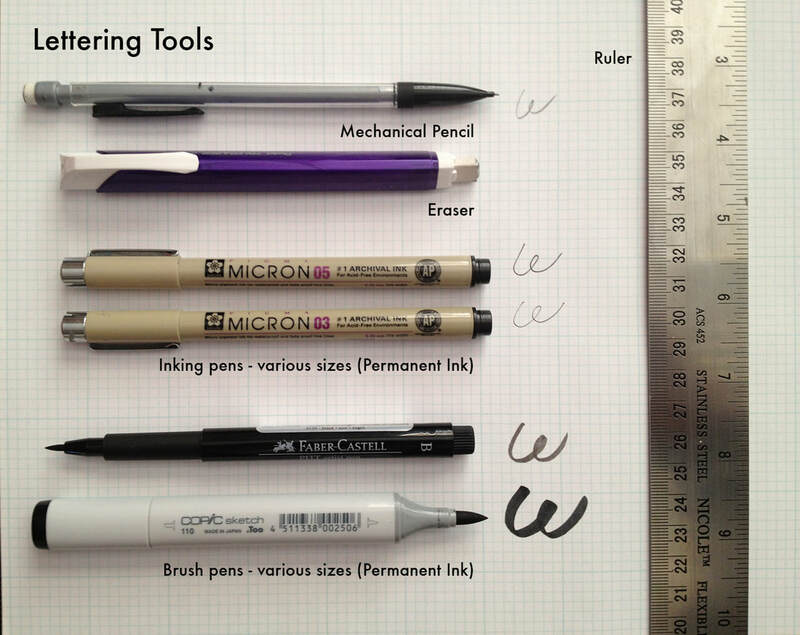 Additionally, seek out brush pens with archival ink—you want your beautiful lettering to last! Without archival ink over time your lettering may fade. The Royal Talens Ecoline Watercolor Brush Pens (Below) and Uni Brush Pen Set are great for dramatic lettering. The Pentel Pigment Ink Brush Pen creates both crisp lines and strong strokes.The ink is dark and wet—it’s one of the darkest we’ve seen. The ink dries in about 10 seconds. After it dries, it is lightfast and water resistant. When your brush runs low on ink, give the barrel a simple squeeze. You can refill the pen with refillable cartridges after the ink runs out. The barrel looks rather long, but its length and slenderness make it feel quite balanced. The Pentel Pigment Brush Pen is typically used for traditional Asian calligraphy but is suitable for modern Western script too. For Asian calligraphy, you can create a dry, streaky brush effect by reducing the amount of ink squeezed out and flattening the tip’s individual hair fibers on the page. Available in 30 colors, the Royal Talens Ecoline Watercolor Brush Pen contains a liquid watercolor paint that is transparent and easy to mix. When you write with this pen, copy paper puckers slightly, just as it would with traditional watercolors. The soft, flexible nib can be used for creating fine details or filling in large areas. The colors and semi-transparent look are great for creating curly, whimsical fonts in addition to artistic illustrations. However due to the puckering on regular paper I suggest trying water color HOT press paper for a smooth effect or Cold Press for that bumpy effect. Here is what I use: (These are NOT affiliate links) Fabriano Hot Press Paper, and Strathmoore 300 Cold Press paper. I specially use these papers if I wish to work on a quote and maybe a little illustration too. Try experimenting with a lighter grey ink beside your text to make it pop off the page. One set of tools I like for this is the Uni Brush Pen Set which awesomely includes three felt-tip brush pens stored inside a convenient black carrying case. 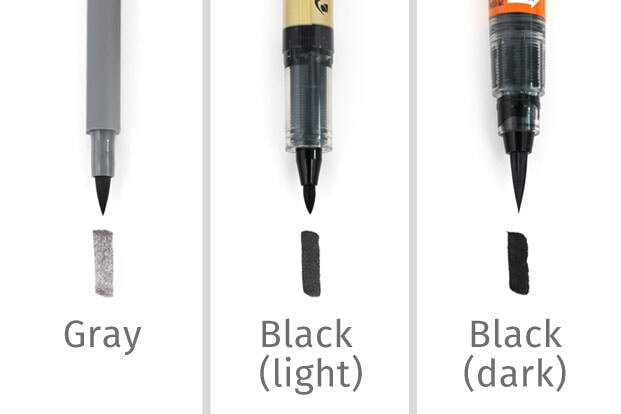 There are 2 black ink brush pens with a broad and fine tip and one gray pen with a broad tip. The black ink is very bold and pigmented, while the gray ink is soft and subdued. The ink dries fairly quickly at around 5 seconds. The tapered shape of the brush pen nib allows for stroke variation, which suits both Western and Asian calligraphy scripts. The pens and the carrying case are small and lightweight, so they are convenient to use on the go. 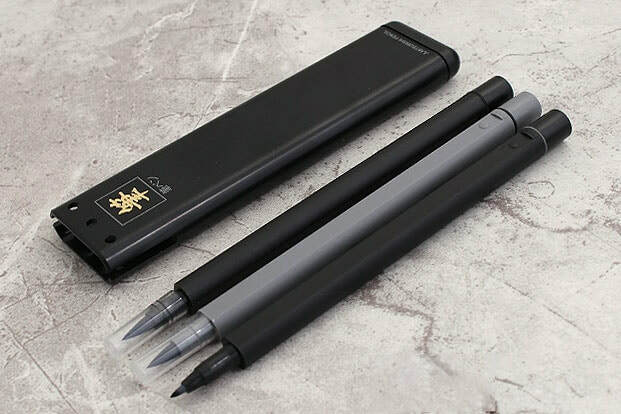 The Uni Brush Pen Set includes three felt-tip brush pens stored inside a convenient black carrying case. There are 2 black ink brush pens with a broad and fine tip and one gray pen with a broad tip. The black ink is very bold and pigmented, while the gray ink is soft and subdued. The ink dries fairly quickly at around 5 seconds. The tapered shape of the brush pen nib allows for stroke variation, which suits both Western and Asian calligraphy scripts. The pens and the carrying case are small and lightweight, so they are convenient to use on the go. Next time we will continue this post with additional tools for beginners. If you frequent social media or have been to a wedding, chances are you’ve seen how beautiful calligraphy can be. 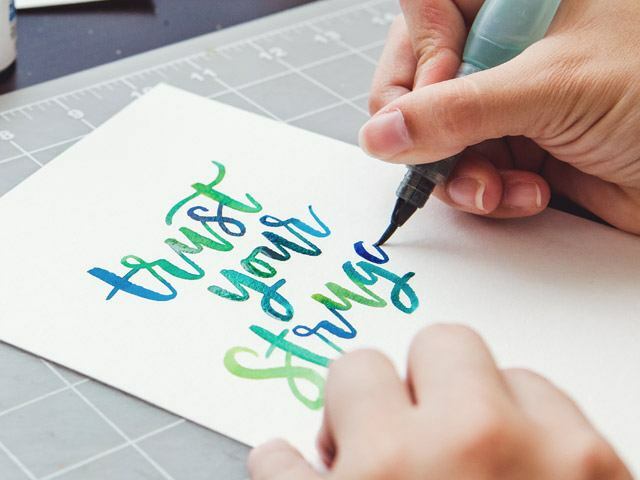 If you’ve ever wanted to learn calligraphy yourself, this article is for you. 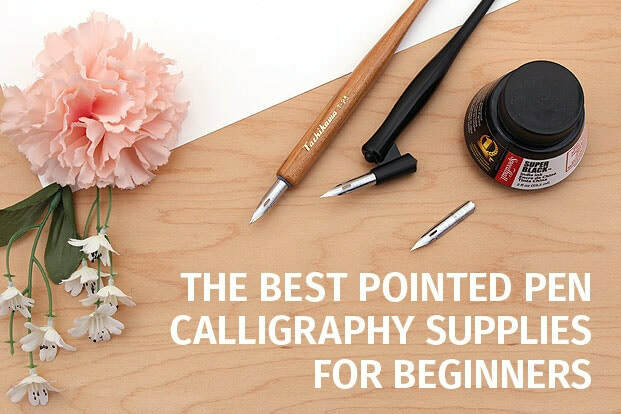 We will go over some of the basic calligraphy tools you’ll need to get started and show you how to use them. We will also be presenting you with the letter H practice kit for free! Will you Share your work with us? We would love to feature you. Contact us with what you have done so far and submit your images to us as well as any tips or hints you have found so far in your journey with us. We would love to share to help everyone! 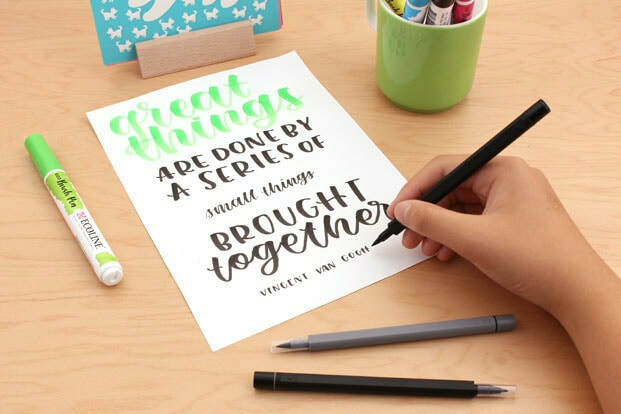 We hope we have given you some additional insight into developing your hand-lettering. Have fun working with the Letter G practice sheets. I highly suggest printing them on to HP Printer Paper, Premium 32. Now that you have some insights on pens and why, (hints on practice sheets too) begin following the directions on your G Sheets. The entire alphabet will soon be ready to purchase as a complete set. Until then Hhhh...eck it was good seeing you! Need Additional Space to practice? 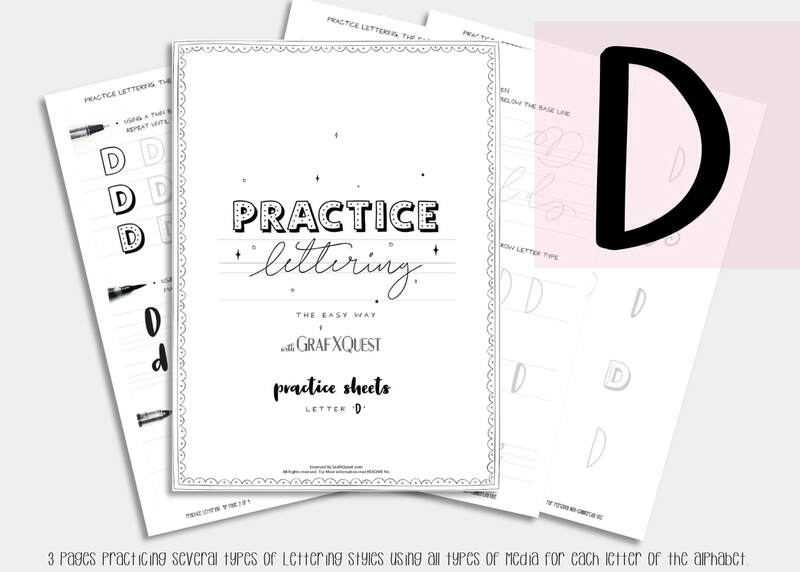 Don't forget your calligraphy practice sheets, now featuring an extra bonus, that track the pen type you use and has six brackets set up for practicing whole lines or single letters. See you next time! 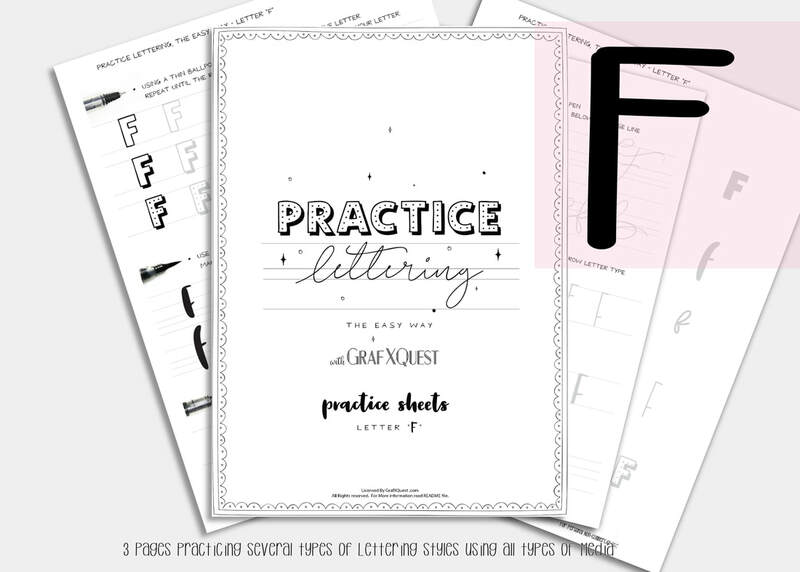 Several posts ago we started you out with some practice sheets so you can start getting the feel of playing with lettering. You will also be able to print those sheets out as many times as you like to have extra space to practice the above lesson. You can get them here: Practice Sheets. 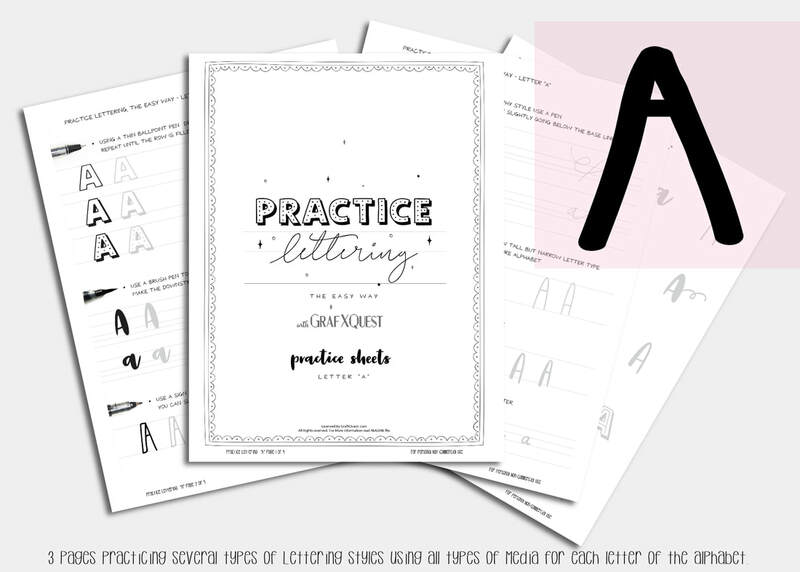 You can also see the previous posts you missed starting with the Letter A here : Lesson A Get the print outs here: Letter A Printouts , Letter B Printouts , Letter C , letter D, and letter E Printouts! Following the instructions laid out in our last posts on the letter A, B, C,D and E be sure to print out your letter F files to follow along. The Letter F Lesson will be available free until October 26th 2018, at which point it will then become a $1 to help support the site. All lessons in this blog are for letter formation and tips for learning Hand lettering and may apply indirectly towards the kit you are working on. However these lessons should assist in most if not all cases in developing your lettering skills with these lessons. We will assume you now have read the posts on the letters A,B,C,D and E plus have printed out your F files and practice sheets, and are ready to work! It takes practice and control to use a brush pen, but you don't have to be a serious artist or calligrapher to create beautiful script. 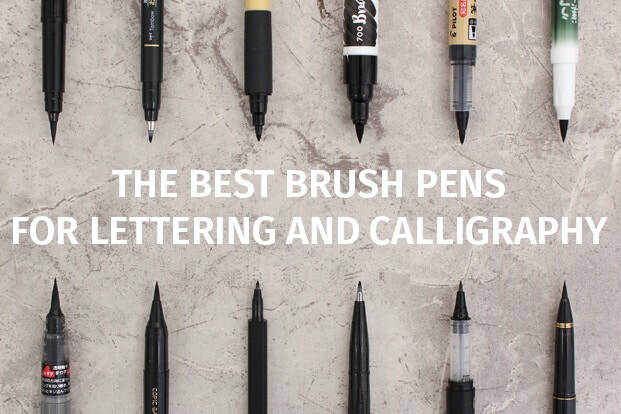 There are many different types of brush pens to choose from and I've compiled a guide to help you find some of the best brush pen for calligraphy. Read on to see our top recommendations for brush pens that suit beginners, dramatic lettering, and Asian calligraphy. There are three main types of brush tips: natural hair, which is made from animal hair like weasel; synthetic hair, generally made from nylon; and felt. Felt tips are good for beginners because their firm tips are marker-like and offer good control. Synthetic and natural hair brushes are softer, so they require more practice to use. Different brush tip thicknesses can be advantageous for different uses. Thin tips allow for more detail but can feel scratchier to use. Broad tips produce less fine details but they feel smoother to write with and create bold, expressive strokes. A brush pen with good ink flow dispenses ink consistently so that you don’t get unwanted streaking or ink pools. Some brush pens have fast ink flow and create wet lines as soon as the nib touches the paper. Other brush pens have slower ink flow, so you can let the tip linger on your paper without creating ink blobs. Brush tips range from soft to firm, depending on their bristle type, density, and size. Felt tips are firm and produce predictable strokes. Loosely packed nylon tips offer more flexibility, but they do have a tendency to fray and lose their shape over time. Bristle tips with individual hair fibers are the softest so they respond best to subtle hand movements and allow for more effects. However, they do require extra practice to master. An elastic brush tip is springy—that is, it demonstrates flexibility and has the ability to bounce back to its original shape. An inelastic brush tip tends to stay deformed even if you release pressure from it. Most standard brush pens come in black ink unless they’re designed for coloring or other special uses. Black inks vary in darkness across different brands. 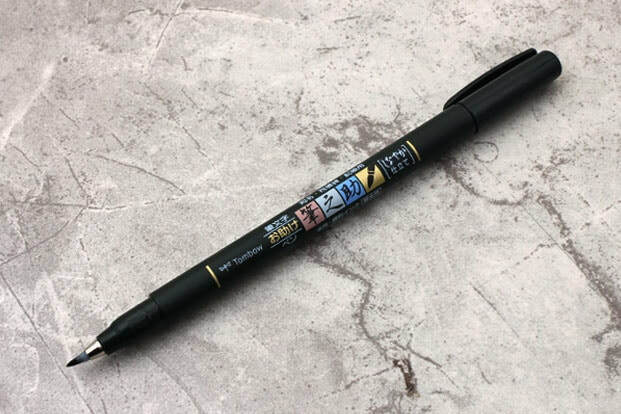 Some pens have a soft black ink like the Sailor Mitsuo Aida Double-Sided Brush Pen while others have a rich, dark black ink like the Pentel Pigment Brush Pen. Pigmentation is a priority if you want your work to be bold and noticeable. If you desire a subtle gradient or a softer look, try brush pens with a muted black ink. Most people are familiar with the feel of a firm felt-tip marker and intuitively know how to control them. Good brush pens for beginners are more marker-like than brush-like. If you’re a beginner, try brush pens with firm tips for easy control and predictable strokes. With some practice, you too can create the beautiful lettering featured on social media. let's take a look at the Pentel Fude Touch Sign Pens. A simple plastic body and secure snap-on cap. Fude means “brush” in Japanese. The Fude Touch’s thin, firm tip demonstrates flexibility. Although thin, it feels buttery smooth to write with, making it suitable for long writing sessions. 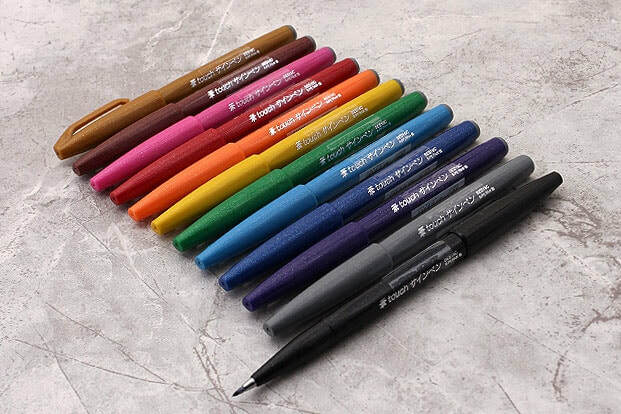 The Pentel Fude Touch Sign Pen comes in 12 different colors. The ink is made of a bright, water-based dye that is perfect for colorful, expressive lines. 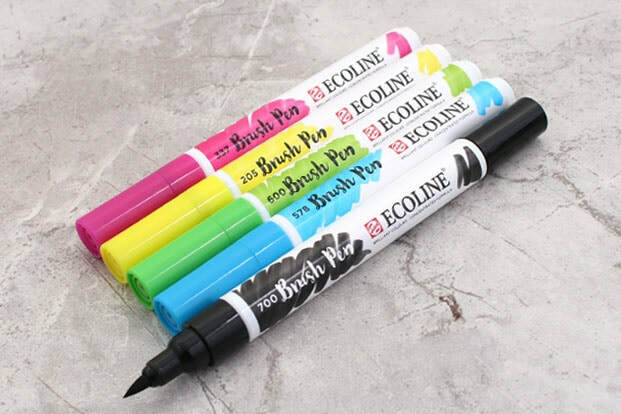 You can use this marker for brush pen calligraphy or simply as a felt-tip marker. Write in your regular hand then press down on the tip to add a few twists and twirls. As a fellow beginner The Pentel Fude Sign Pens Helped me tremendously. 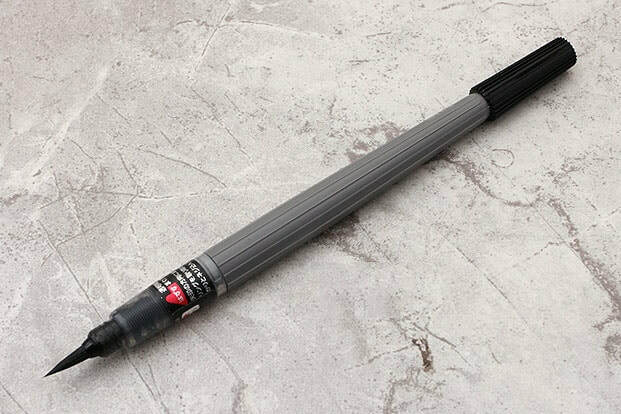 The special elastomer tip of the Tombow Fudenosuke line allows calligraphers to control strokes with precision. Elastomer is an elastic material that can be stretched. When released, it returns to within 90% of its original shape. The Fudenosuke tip retains its shape even as you apply various levels of pressure. The firm composition of the tip is great for creating extra crisp hairlines for invitations, greeting cards, and other crafts. The brush pen yields a neutral black ink that is fade-resistant and is my personal choice because it is waterproof. It’s also available as a double-sided brush pen with a black tip and a gray tip. The pen comes with a blue plastic template for writing kanji characters on money gift envelopes. In Japan, it is customary to gift envelopes to family and friends for occasions of celebration or grief. For occasions of grief, one would traditionally use gray ink. In Japanese, “Kokoro” means heart and “iro” means color. This is the CocoIro which was specially created for customizing your pen to match your heart and mind. You have plenty of color options for building a pen that’s truly your own, from the pen bodies to the ink refills. the refills come in 11 colors. The CocoIro’s extra fine tip is flexible, but also firm enough that it’s easy for newbies to create thin, elegant letters. Available in 11 different colors, the ink is water based and water soluble. The separately sold bodies have streamlined bullet shapes and soft surfaces. To assemble a CocoIro pen, remove the transparent cap from the refill and insert the nib into the pen body. Screw the threads of the refill and that of the pen body together firmly. Our last and second favorite choice for beginners is the Pilot Futayaku which means "two uses" in Japanese. This double-sided pen has two hard felt tips, one medium and one fine. Both tips will create seamlessly tapered lines with the right amount of pressure. The medium tip is softer and more flexible than its fine counterpart. The pen’s ink delivery is constant and juicy. The ink itself is a satisfying opaque black color. It offers some water resistance but isn’t entirely waterproof. Also, keep in mind that its 30-second ink drying time is slower than some of the brush pens mentioned in this guide. Next time we will continue this post with Dramatic Lettering for beginners and the letter G. Will you Share your work with us? We would love to feature you. Contact us with what you have done so far and submit your images to us as well as any tips or hints you have found so far in your journey with us. We hope we have given you some additional insight into developing your hand-lettering. Have fun working with the Letter F practice sheets. I highly suggest printing them on to HP Printer Paper, Premium 32. Now that you have the right pens (hints on practice sheets too) begin following the directions on your F Sheets. The entire alphabet will soon be ready to purchase as a complete set. Until then G it was good seeing you! Need Additional Space to practice? Don't forget your calligraphy practice sheets, that track the pen type you use and has six brackets set up for practicing whole lines or single letters. See you next time! Catch up time! Haven't started the Lettering classes yet? For this week only catch up for free and download letters A-E for free. Read on to find out how! 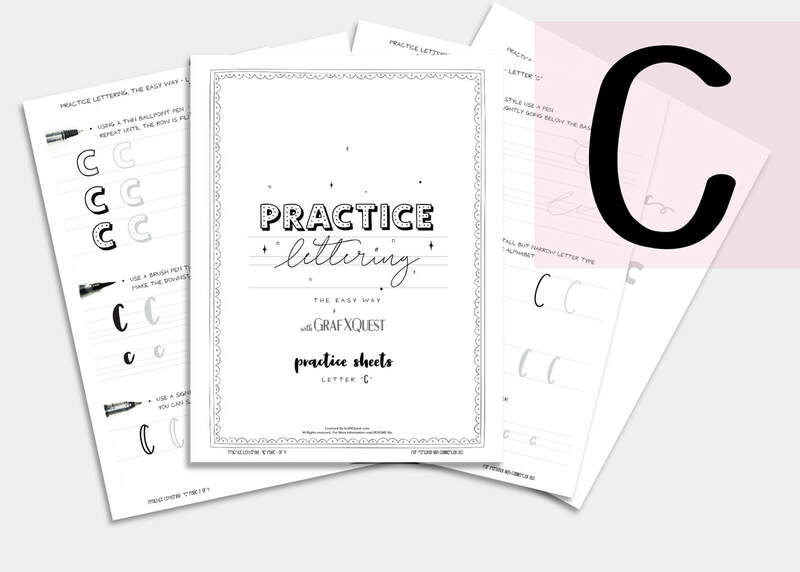 Several posts ago we started you out with some practice sheets so you can start getting the feel of playing with lettering. You will also be able to print those sheets out as many times as you like to have extra space to practice the above lesson. You can get them here: Practice Sheets. You can also see the previous posts you missed starting with the Letter A here : Lesson A Get the print outs here: Letter A Printouts , Letter B Printouts , Letter C Printouts, letter D Printouts and now letter E Printouts! Want to share these with someone else? We ask that you do not share our files, instead share our link above to this post. Thanks. Be sure to read the first post for letter A as it will have some important hints to help you along with these lessons. Lets Move on to to the letter E.
Following the instructions laid out in our last posts on the letter A, B, C and D be sure to print out your letter E files to follow along. The Letter E Lesson will be available free until October 19th 2018, at which point it will then become a $1 to help support the site. For a limited time get kits A-E for free until October 19th 2018. Add them all to your basket and then use code CATCHUPletters at check out to get them free. All lessons in this blog are for letter formation and tips for learning Hand lettering and may not always apply directly towards the kit you are working on. However most of these lessons should assist in most if not all cases in developing your lettering skills. We will assume you now have read the posts on the letters A,B,C and D plus have printed out your E files and practice sheets, and are ready to work! Today we are going to talk about paper types when lettering. 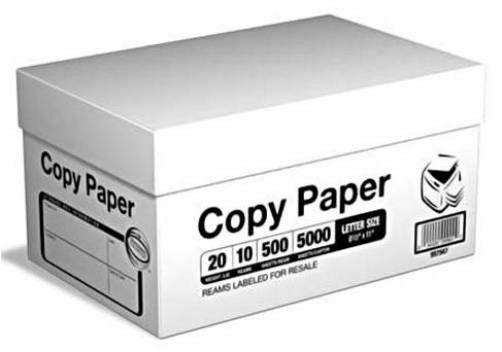 Does it makes a difference if I use a specific type of paper? Most lettering beginners when they start their lettering journey, think only about getting the proper writing tools and the proper writing surfaces often get overlooked. For instance...If you are working with brush pens (felt tips) the best paper you can get is always smooth, bleedproof (non absorbent) paper. Bleedproof paper will help your ink last longer but it will also prevent your brush tips from fraying. Let’s take an in-depth look into paper so you can have a better understanding on different types and how to use them to your advantage. I'm sure you know that there are different types of paper on the market, but unfortunately till this day I come across beginner videos on line where they use a water brush on regular printing paper. EEK! I mean how would you know unless someone told you what you should be using? For this reason we have a quick guide to give you some direction. Once you understand the benefits of choosing the right paper with the right media, the only thing you will regret is not having known sooner! The benefits of using the right paper and the wrong kind. This is based on personal experiences and there will always be better options out there, if you found something better out there please comment below to share with others! The difference between papersThe first noticeable difference in papers is made by touching them. Some of them are smooth to the touch and others are rougher, and on top of that on some papers you can spot the grain difference just by looking at them, or holding them up to the light. Depending on the lettering tool you wish to use you will pick a certain type of paper, however, we will talk more about it in a few moments. The benefits of using the right paperThe biggest advantage of getting the right paper is that it saves you money. Brush pens are a tool which have a certain life span – depending on the frequency of usage, and by using the proper paper you are able to prolong the lifespan (to it’s maximum potential) of the brush pens. You are prolonging the lifespan of the brush pen because the ink is not getting soaked up into the paper – hence the name bleedproof! In the long run, it means that you are spending less money on supplies! 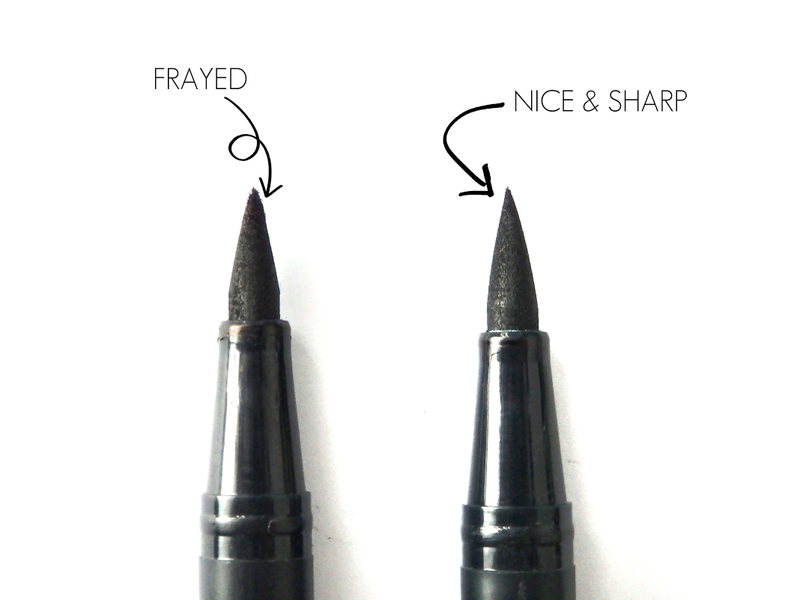 Another benefit from using smooth, bleedproof paper is that you are preventing fraying of the brush tip. Fraying causes the brush pen to lose the original elasticity which makes the transition between thick and thin much more challenging. Regular copy paper has longer and more coarse fibers which are literally tearing apart your brush tips with every single stroke that you are making. Using bleedproof paper, the ink from the brush pen will not spread on the paper which will keep your lettering nice and crisp. Remember that these benefits are mostly related to felt tip brush pens. Best papers for calligraphyNow let's talk about some of the best papers for calligraphy. I will also mention some of the most popular calligraphy tools and what paper is most suitable for that specific tool. Brush pens (felt tips) – as we already mentioned at the beginning, the best paper for your brush pens is smooth, bleedproof (non-absorbent) paper. HP Printer Paper, Premium 32 – a great choice if you are looking to print some practice sheets and its also a great deal considering the price-quantity ratio! Remember this is a personal choice of papers based on testing, but generally you can get whatever brand you wish as long as it is bleedproof to extend the life of your brushes. NOTE: Bleedproof paper will work great with dip pens – whether its copperplate or blackletter calligraphy. When you work with watercolors, either with a regular brush or a water brush, it will require a different type of paper. Watercolor lettering tools are the opposite when compared with felt tip brush pens. Watercolor paper is much thicker and absorbs the excess liquid. Unlike with the brush pens which are made from felt tips, the water brush and regular brushes are made from synthetic hairs (some brushes even with real hair) and that means that you don’t need to worry about fraying your tip due to the rough paper surface. Regular paper is not suitable for watercolors because it simply can’t absorb that much water and gets easily destroyed or loses its shape. 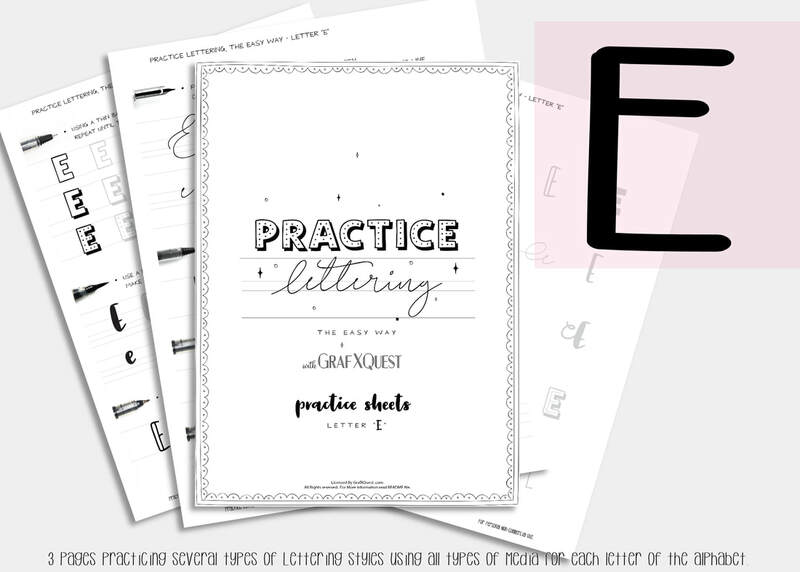 Best paper for hand lettering.You may or may not know, but hand lettering and calligraphy are two different things. Calligraphy is the art of beautiful writing while hand lettering is the art of illustrating letters (drawing each shape separately). Essentially this means that for hand lettering you mostly use different tools compared with calligraphy. 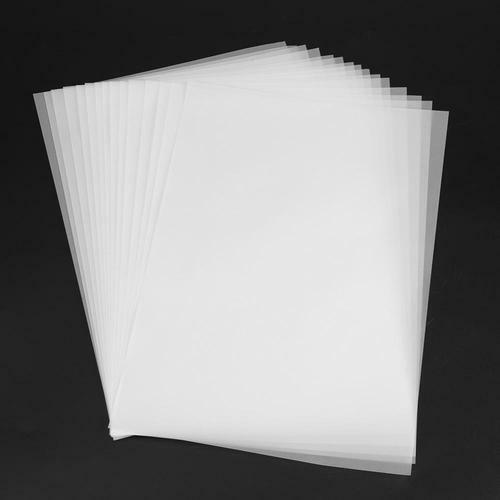 Another great investment for your hand lettering when we talk about paper is tracing paper. The great thing about tracing paper is that it works wonders in combination with a light tablet – you can literally endlessly refine your piece, or at least until you are satisfied with it, just a like layers in Adobe Photoshop. The most essential tool for hand lettering is a pencil, and alongwith the pencil an inking tool is used such as the Sakura Pigma Micron pens. In that case you can even use regular copy paper as it wont damage your tools. 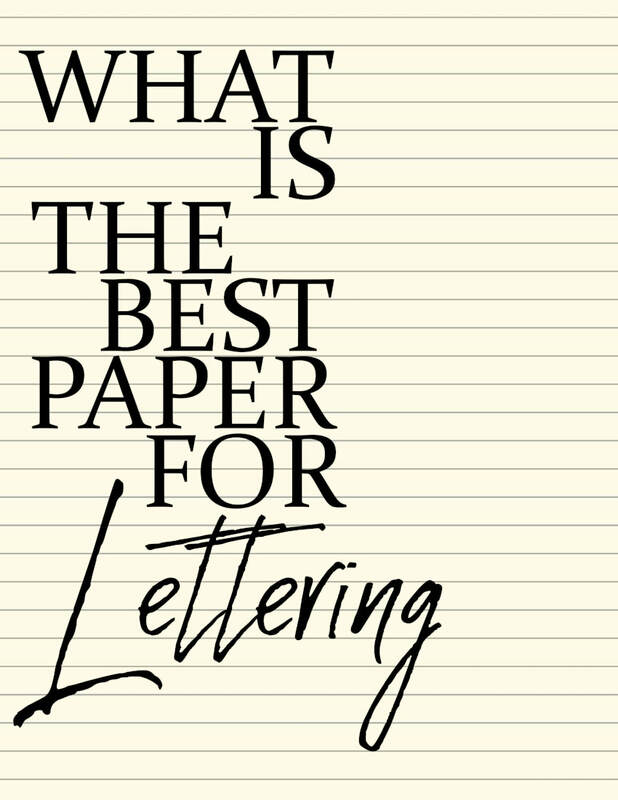 Now that you know more about which paper to choose be sure to find the right pens for your lettering style by practicing and using the correct papers to save your investments! Share your work with us? We would love to feature you. Contact us with what you have done so far and submit your images to us as well as any tips or hints you have found so far in your journey with us. Join us again soon for the Letter F.
Need Additional Space to practice? Don't forget your calligraphy practice sheets that track the pen type you use and has six brackets set up for practicing whole lines or single letters. See you next time!